There is no possibility of denying the arrival and subtle changes, some anticipated , some evident and some unforeseen, that the fourth industrial revolution has brought about in the legal industry. If you are still doubtful of same, research indicates that 45% of jobs can be automated and that at least 60% of any work performed by humans on a daily basis can be performed by AI. Given that machines and AI robots will be able to apply the law faster, more cost effectively and more accurately than human lawyers, it is undeniable that the fourth industrial revolution will revolutionize the way the man on the street accesses the legal industry. The legal industry will be more accessible and cost effective, eliminating the timely and costly consults required by legal practitioners to fully understand and assist a client with a legal matter, which often inevitably leads to lengthy litigation, as machines and AI robots will be able to provide legal advice, contracts and settle disputes by the mere click of a button after scanning through volumes of legal precedents in a matter of seconds, all from the comfort of the client’s home. However, despite the fact that Machines and related AI robots ,with programme learning and data algorithms generating an artificial intelligence enabling the accurate performance of more human like activities such as reasoning, decision making and judgement calls, humans still have the upper hand in emotional intelligence. Our emotional intelligence, which refers to the ability to be aware of, control, and express emotions, in addition to being able to manage interpersonal relationships thoughtfully and compassionately serves to set us apart on an unprecedented level from Machines and AI robots. Humans have the ability to show sympathy, empathy, consideration, care and concern which serves to trump the cold hearted nature of machines and related AI robots when it comes to one on one contact matters, such as divorces, child custody cases, maintenance cases, employment and personal injury matters, just to mention a few of the many areas in which a client’s legal matter requires more than just the uninvolved objective application of the law to the facts of a matter. So although we cannot control the future developments and inevitable changes that the fourth industrial revolution will generate in the legal industry, we can control our approach to the fourth industrial revolution by ensuring a competitive edge over machines and AI robots, by enhancing our emotional intelligence and embracing artificially intelligent machines and robots as our colleagues, or very least assistants, to provide compassionate and sympathetic legal services faster, more cost effectively and more accurately. 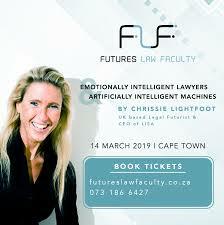 Ensure your competitive edge in the fourth industrial revolution by attending the Futures Law Faculty keynote: “Emotionally Intelligent Lawyers and Artificially Intelligent Machines – Better Together” with international legal expert and futurist, creator and owner of Robot Lawyer Lisa, Chrissie Lightfoot on 14 March 2019 at White Space at Red and Yellow (97 Durham Avenue, Salt River, Cape Town) from 16:00. For more information see www.futureslawfaculty.co.za. Book your tickets via quicket.